Tried googling for workarounds to no avail, do you have any ideas why this is failing? 1. What’s your IP Address? 2. What’s your domain (you can masking your domain)? 3. Information status about DNS (service named status)? Thanks for the reply, I’ve found the problem it was related to my domain name. The guide is solid my spelling on the other hand is not! Thanks for your info. That is my mistake not explain why should be disabled. That is because i am usually using Firewall/Router Appliance for filter and rule. Hi, Reverse Zone needed ? Becos you are not configured reverse lookup zone. Just forward Zone is enough. Because this is just local DNS. i think gmail, yahoomail and other major email service providers block messages from my server and one of the reasons they cite is ‘no reverse DNS’ found. Would you like to add the zone here! I want to use my local windows AD DS Server. how can i accomplish this one? do i need to Configure local DNS Server on my centos mail server? Hi, nice job…congratulations for the tutorial. You could do a step by step tutorial for backup of all emails . Thank You. Iman, thank you for your prompt reply and also for your contribution to the technology. Hi Iman, check the files you mentioned me and cold today I realized that he had mistyped an address on the host so that was not resolving properly. Now I run the installation again and if you notice something wrong. We have just migrated one of our Zimbra hosted domains to an external mail server and modified MX records accordingly. Mail is now arriving at the new server successfully, unless it is sent from one of the other domains hosted on our ZImbra installation where it gets delivered to the “legacy” domain locally. How do I get Zimbra to route all email traffic externally running correct MX lookups to the new server, rather than using local delivery? please note that iwould not want to delete or rename the domain from the old server. That is nice, however i host more than 80 domains on the server ..and would wish to formulate a script that automates the process on a domain basis.If you could asist me in ensuring that zimbra performs MX lookups even for local domains (domains on the server), then iguess the issue will have been solved….as changing the mx record for the domain will solved the problem. in the current situation, zimbra seems to be ignoring mx lookups for locally hosted domains however much they have different mx records. Again by specifying your knowledge here. I tell my problem, the server to send arm works well but can not receive email. I’m doing the testing in a laboratory armed with an Internet connection that we are changing along with the mail service and pfSense firewall. Production services were configured by a service company so they delegated their dns in domain registration and the different tests I do DNS and point to the test mail my working network connection. I somehow make it work without touching anything that is working, or you would have to do to work ?. I need help how can I change my default domain. I have 4 domain on my zimbra mail. I already migrated my first domain example03.com this domain has smallest user account. That why I make this as my primary mail domain on zimbra. Since I Already created all users on remaining 3 domains and initially migrate their mailbox using imapsync. Another question: instead of creating local DNS on zimbra server it’s OK to use my internal Windows DNS server? “Oops! It appears your browser does not allow cookies. You need to enable cookies in order to use the Zimbra Web Client”. 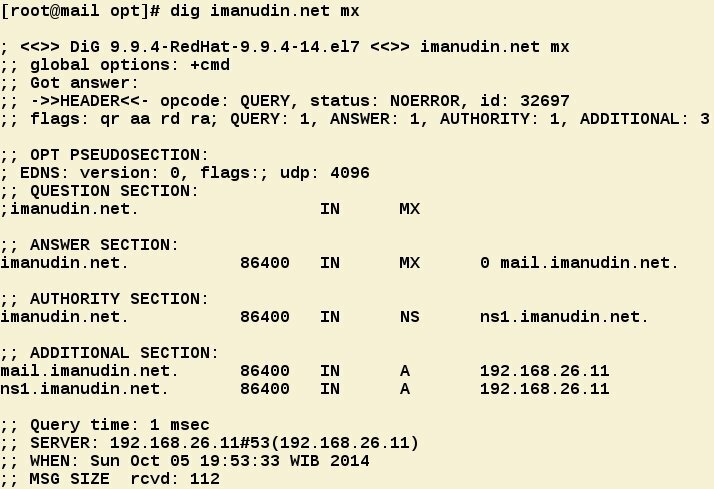 AM wondering where to go next..
Hi iman I have a doubt how can I establish the hostname and the domain ? when i do the step service named restart, the Job for named.service has failed. what is the problem with this step? i have a question how change the hostname server in zimbra? kalo konfigurasi untuk 2 ip gimana ya? terima kasih sebelumnya, untuk menambahkan ns2.local.domain gimana caranya yah ? mas iman, mohon maaf mengganggu kembali. saya sudah berhasil kirim email keluar maupun masuk. akan tetapi tempat saya mendaftarkan hosting, membutuhkan 2 ns sebagai cadangan. mohon bantuannya untuk penambahan ns2-nya mas. mau tanya lagi, saya sudah beli domain, menggunakan ip public juga. kirim email antar ip dengan blok yang sama sudah berhasil dalam 1 provider. tetapi email keluar tetap failure. sepertinya port 25 saya di blok oleh ISP, adakah cara lain untuk mengganti Port 25 tersebut mas ? Hi Iman, can you help me with the guide on how i can install zimbra using Cloudflare as a thirdparty DNS ? If i use cloudflare to route the nameserver do i still need to BIND the DNS ? need help in adding external email address in galsync address book. i did adding email address in galsync@example.com address book but when i type email id in new email its not showing up..